Tonight is the end of summer, thus beginning my personal favorite time of year, the earth reaching its peak of life as the chill of the coming winter months sets in. And this night marks a rare event. The Super Harvest Moon. For the first time in almost twenty years, when the sun set, it blended with the autumn moon as it rose, creating a unique twilight As the two low rising and setting light sources intertwined together in the sky, the twilight is uniquely illuminated. In case you are wondering, the image to the side is one of my new favorite things. 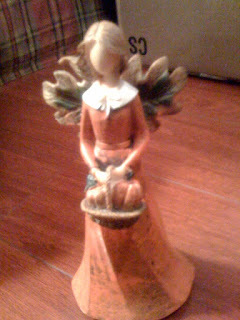 An autumn angel, in her orange dress she holds a basket of pumpkins, with fallen leaves as her wings. Sounds like my idea of heaven. 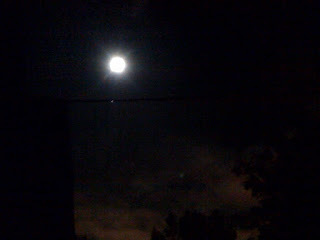 Here is the view of the autumn moon, much later in the night, from my back porch.